Aeroquest Mapcon was contracted to provide 30 cm & 50 cm colour orthophotography with 1.2 m ground spacing spectral encoded DSM for 16,500 square km. Aeroquest Mapcon was contracted to provide 10 cm 4-band orthophotography, a Digital Terrain Model (DTM), Digital Surface Model (DSM) and a Digital Canopy Model (DCM) for approximately 750 ha. 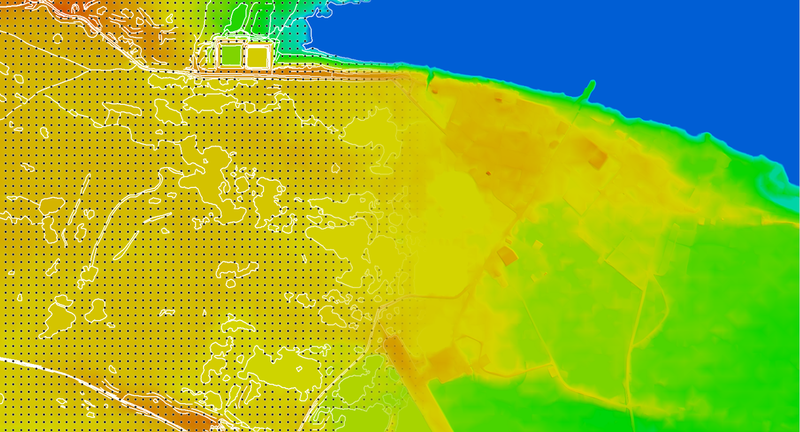 For the Digital Canopy Model, all ground elevations were normalized (brought to zero) so that tree canopy heights could be easily measured and visually analyzed. Aeroquest Mapcon captured aerial imagery using a UAV to generate a colourized point cloud with a density of 950 points per square metre. This was used to calculate the volume of fill delivered to a building site. Aeroquest Mapcon was contracted to generate 30 cm orthophotography in addition to a Digital Terrain Model to be used for rectification and for delivery to the client, for >10,000 square km. Aeroquest Mapcon was contracted to generate a DTM and DSM from Digital Globe GeoEye-1 satellite imagery.